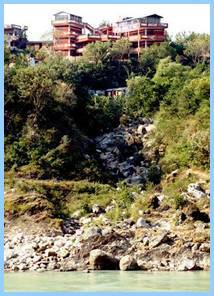 From February 22nd till March 23rd 2014 we will offer a 14day retreat at Arunachala followed by a 14day retreat in Rishikesh at river Ganga in Northern India. Participation is possible at each one separately or in combination. Early booking recommended to make sure you can stay in the same ashram/house, in which Satsang will take place. In case all rooms are taken, our cooperating travel agent can help with finding alternative accommodation nearby. Participants will be responsible for their own travels. You can, however, travel together with the group with Torsten and Padma (specific flights will be recommended for your individual booking). The expenses for this retreat will be about 800 € at Arunachala, 700 to 850 € at river Ganga and around 1400 € for the combined retreat at both places. This includes seminar fees, transfers from and to the airport, if travelling together with us, as well as lodging and breakfast (at Ganga, respectively 3 meals, tea and water at Arunachala). In addition you may need some 30 to 60 € for day trips and 600 to 1300 € for flights from Europe. At our 2011 visit to river Ganga, Markus did some filming, which he is now presenting here: first part now also with English subtitles. New Videos of our last visit to river Ganga in 2013 will follow here soon (please check again in the next few days). For the Hindus the Ganges (an approximately 1500 miles (2500 km) long river in north India) is the incarnation of the goddess Ganga and primarily symbolizes spiritual purity. 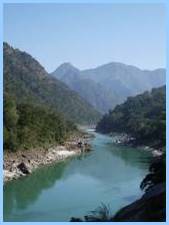 Furthermore Ganga is connected to God Shiva. According to hinduist mythology, as she fell to Earth, Ganga's purifying torrents would have utterly destroyed it, had Shiva not slowed them down with his hair. Through his long braids he let the floods flow softly onto the Earth. For the Hindus, the water of the Ganges is holy. In many rituals it serves for strong spiritual cleansing. For the Satsang-tradition, which came to the west through Gangaji and Eli Jaxon-Bear, the Ganges has a special meaning as well. 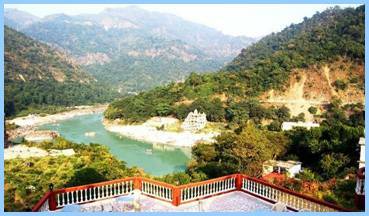 Their teacher Poonjaji himself loved the Ganges, especially the area around Haridwar, Rishikesh and Laxman Jhoola. In his later years he often spent his summers here and met with many spiritual seekers. Gangaji also met Poonjaji in Haridwar at the Ganges for the first time and it was here that she recognized him as her Satguru. It was also there that she got her name from him. Reinheit. Our journey will lead us to Laxman Jhoola, a village near the small town of Rishikesh (the closest larger town is Haridwar). In the area around Rishikesh the Ganges is still very pristine. The water in the river is clean, there are rapids and areas with small beaches, covered by fine sand. 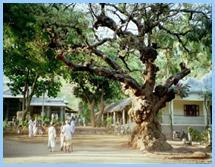 The village of Laxman Jhoola has been quite well known among western spiritual seekers for many years. The restaurants and housing have adjusted in such a way that food suitable for westerners and comfortable lodgings are easy to find. As soon as you leave the village in a northerly direction you come to a natural area which is very inviting for walks, abiding at the shore of the Ganges or taking a bath in the Ganges. Furthermore it's possible to undertake organized excursions from Laxman Jhoola to the surrounding areas. View of the Hotel from the Ganges. The hotel also houses a little restaurant run by Indian-Nepalese cooks, who are well experienced in providing food for westerners. For retreat rates please contact us. We look forward to our time together at the holy Ganges.". 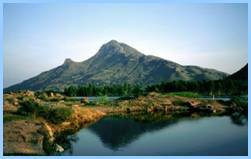 During the two weeks stay at Arunachala there will be an opportunity to explore Arunachala - as a group or alone - and visit the various places where Sri Ramana Maharshi lived. Furthermore there will be the possibility to take part in the various activities taking place in the Ramana-Ashram. 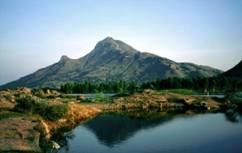 Daily Satsangs with Padma and Torsten will take place on the roof terrace of the Sri Nannagaru Ashram with a view on the Arunachala. Participants of this retreat will also be housed in the same building, which is situated in a quiet and beautiful spot. As needed, additional meetings with Padma and/or Torsten can be offered. 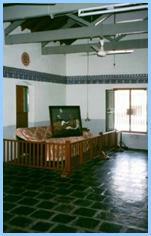 The "Old hall" where Ramana lived and gave darshan. It's still open to the public today and is used for quiet meditation.